21-year-old Jaquev Jones was reportedly shot and killed following an armed robbery at a Texaco gas station Saturday night, January 16, 2016. 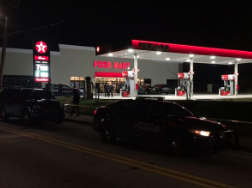 The AJC reports, gunfire erupted outside a Texaco gas station on McDonough Boulevard, during an armed robbery, around 9:00pm. The victim apparently told police he crashed his car while trying to escape robbers who were firing at him. A second victim, Jaquev Jones, suffered a gunshot wound to the back “in the same area…somewhat at the same time.” Mr. Jones was apparently able to get himself to Grady Memorial hospital, where he later succumbed to fatal injuries. Police are now trying to determine if Mr. Jones was also a victim of the Texaco robbery-shooting. Police have not yet identified the gunmen.